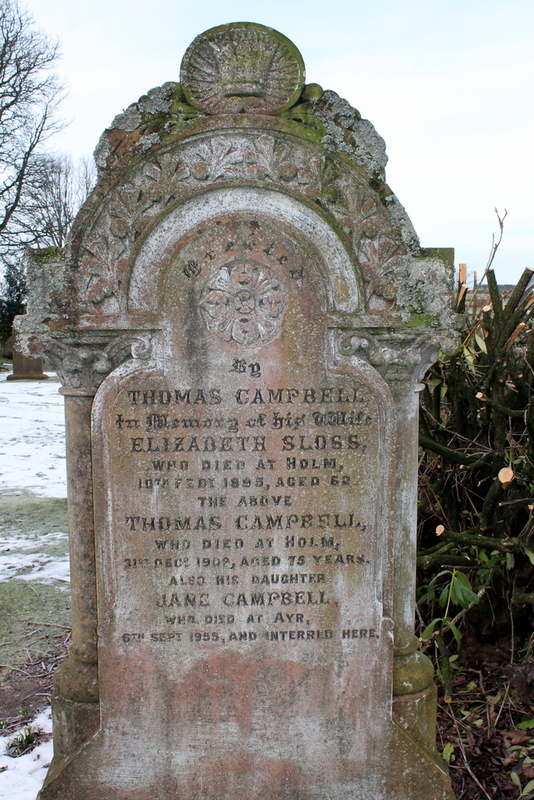 Erected by Thomas CAMPBELL in memory of his wife Elizabeth SLOSS who died at Holm, 10th Feb’y 1895, aged 62. The above Thomas CAMPBELL who died at Holm, 31st Dec’r 1903, aged 75 years. Also his daughter Jane CAMPBELL who died at Ayr, 6th Sept. 1955, and interred here. GC, “Kirkyard gravestone 181,” Carsphairn Archive, accessed April 20, 2019, http://carsphairn.org/CarsphairnArchive/items/show/223.